My daughter, Kirsten, just turned 2 this weekend, so now that I'm done with her party I'm starting on the next big project. I'd really like to get her mostly potty trained before going to Iceland in a month, but I need to get her into a big girl bed so she can get up when she wakes up to go potty. At least, I think that is how it works. So, even if her room isn't even close to ready I really need to get her into her big girl bed. 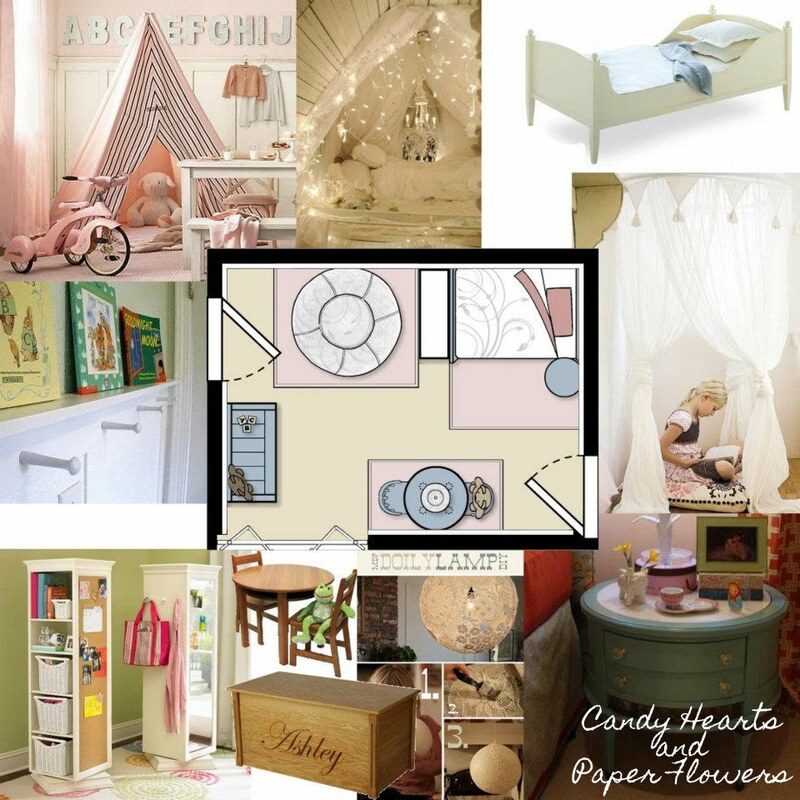 I have a lot of ideas and inspiration also pinned on a Pinterest board just for her room, if you want to take a peek. And the room itself, note the seemingly tight crop... it's just because the room is small and there is no way to stand back far enough to get more of the room in the shot! I'm actually standing in the closet for this picture. 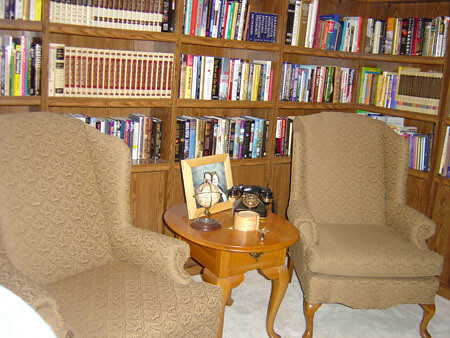 So, no pictures of the wallpaper, but I'll take some before pictures after we pull out all the bookcases. The carpet is very light cream and while not the best choice for a toddler's room, it'll stay for a few years until we put hardwood down throughout the house. We'll be turning the library/office into her big girl room. The last step of the transformation will be replacing the door in the upper right corner with a hidden bookcase door that swings out into the family room, like the first three on my hidden door post. I envision putting face front book ledges on that door facing into her room for her to use, but I need to keep the door light enough for her to push open. This will increase the usability of that corner slightly. Currently the door is a glass paned door which lets a lot of light in that room; great for the day, terrible for summer nights. So, I'll have to think of something there. Suggestions? Starting in the upper right corner, the bed is a photoshopped image of a toddler Bump Bed, I wanted the sleigh headboard area and Swedish footboard area and hubby was going to build it for me. 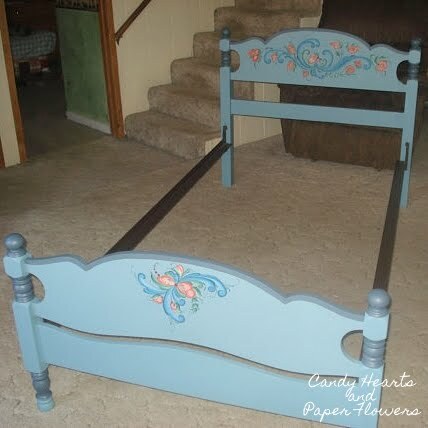 After awhile I got a little more realistic about what our time would allow and found a sweet rosemaled single bed from a seller on Etsy. She was great to work with and I highly recommend her if you love rosemaling. This is actually the sellers photo, but I don't think she'll mind me using it to share. Since the single bed is a bit longer than I was planning for, I may have to make adjustments for where I have the bookcase and canopy area, which brings me to the next picture. I really wanted to make her a round canopy with a hula hoop, white fabric, and white twinkle lights. I imagine it with a big pillow on the floor for us to snuggle in to read. I'd like a small round bedside table for her, ideally with a little storage like the table in the lower right corner. I have a whole bunch of white/cream doilies from my hubby's grandmother, that no one else wanted. After I saw the doily lamp I thought that would be a sweet idea for them above the little table and chairs. I'd like some enclosed toy storage, though I'm leaning more towards a closed cupboard with baskets now instead of a toy box. A small table and chairs on the one wall for coloring or tea parties; we already have two chairs just need a table. For the bookshelf at the end of her bed, hubby is going to build it for me. 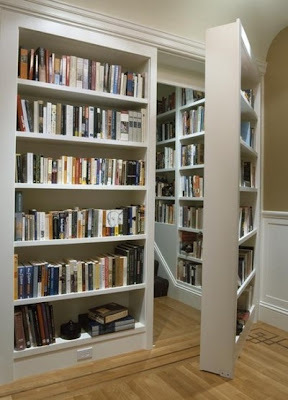 I'd like the top three shelves to be open to both sides with the back running down the middle, like two shallow bookcases back to back. Towards her bed I'm thinking of room for some bed time books and stuffed animals, nothing heavy. The bottom of the bookshelf would have deeper shelves opened to her reading nook with room for bigger heavier books and toys. The side of the bookshelf facing the room I'd like lined in cork for pinning up pictures and artwork. Currently the whole room is wallpapered in a baby blue background with large cream magnolias!!! It is pretty wallpaper, but not what I want for her room. So, I will be tearing it down and putting up board and batten. Everywhere you look people are putting up board and batten, I know. Hers won't be white though, we'll do oak board and batten and I'll use the lightest stain (natural?) so it'll match the woodwork in the rest of the house. 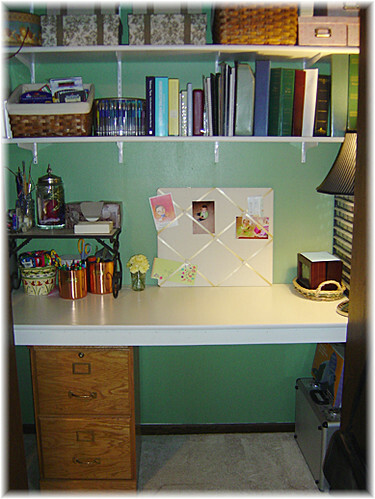 I also want to put shaker pegs right under the rail along the wall by the table and chairs. She can hang up her apron or a sweater or whatever that way. Ideally, the one closest to her closet will hold the outfit for the day that she'll pick out the night before. We'll be installing a full closet organizing system in that closet like we did in the nursery and the master closet. I LOVE a good organized closet and it eliminates the need for a dresser! I'm not even going to think about paint color until I see what tones we'll end up with in the board and batten and how the rest of the room comes together. I want to find all the furniture first, figure out what I can paint and what I have to "live with". I want the room to feel calm and peaceful, so I'll figure out what I have to "marry" with paint, then go from there. I will tell you though that the ceiling will be getting a soft blue gray paint definitely and will be stripped of it's texture. I painted the green in the closet, I pulled it from the darkest green in the magnolia leaves on the wallpaper. Green is my favorite color, but I wouldn't use it elsewhere in the house (it just wouldn't coordinate well). It's a fairly dark green, so covering it up with primer will be oodles of fun, I'm sure! I want the room to have a very light feel to it, since it is so small. So, except for the bed I want the furniture and the bedding to all be very light. She'll be using the down comforter and pillow from Iceland that I had as a little girl and I have several sets, some hand embroidered, for her to use. I can't wait! So, I have a bunch of spring projects, plus this bedroom to get working on. The three closets can get their coat of paint and shelving added at the same time as we are doing her closet system. The garage might get pushed off to the end of the month... oh wait, it is almost the end of the month. Hmmmmm... May? This is going to be a BUSY summer!